Apex Fasteners carries a broad variety of nuts available for your applications in both metric and imperial sizes. Nuts provide stability, closure and locking ability among other uses. Our staff will work closely with you to determine the best fastener for your application. Acorn nuts and Cap nuts typically appear to be a hex nut with one end crowned or domed-shaped. Such nuts can have closed or open crowns. Some are assembled from two parts. Crowns come in three sizes, normal, High or Low crown. Such nuts are often used as an aesthetically pleasing finishing nut. Flange nuts integrate a flange to one side of a hex nut. The flange is typically more robust than an attached washer, providing far greater strength. Flanges can be smooth, serrated or reverse serrated on their underside as required. Hex nuts are often described by their dimensions. There are hex nuts, jam nuts, thick nuts, small pattern hex nuts, machine screw nuts, flat hex nuts, slotted hex nuts, thick slotted hex nuts, heavy hex flat nuts, heavy hex flat jam nuts, heavy hex jam nuts, heavy hex slotted nuts and hex coupling nuts. Often found in furniture assemblies, the Joint Connector Nut provides torsional strength in a butted application. This item is also called a Cross Dowel Nut or a Barrel Nut. Any nut can be manufactured with a locking feature. The most common locking nuts include Keps nuts, Nylon Insert Lock nuts and All Metal locknuts. 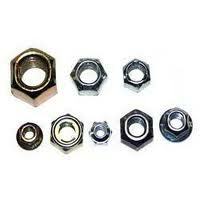 Once the most commonly used nut, square nuts have been largely replaced by hex nuts in modern manufacturing. Square nuts are also seen as part of Cage Nuts Assemblies. 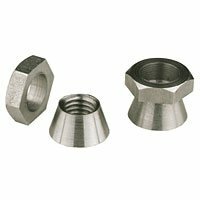 Square nuts can be chamfered on one or both sides or even washer crowned. 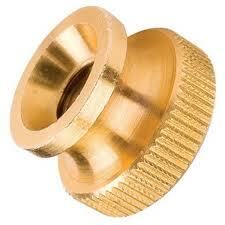 T-nuts and propel nuts have an internally threaded central barrel and a flat base with or without prongs. T Nuts come with a variety of features including straight barrels, tapered barrels, 3 prongs, 4 prongs, 5 prongs, all in varying sizes. 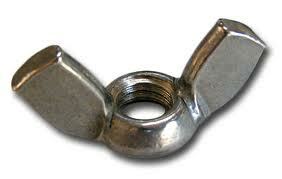 Propel nuts are a specialized form of t-nut. The most common tamper resistant nut is the breakaway nut. 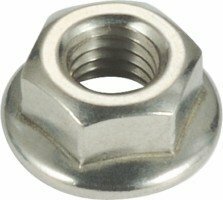 Breakaway nuts have a hex-shaped component which permits installation of the nut. Once the nut is seated, additional torque will break off the hex-shaped portion of the nut to prevent removal of the nut. Thumb nuts are so named because they are typically tightened using the thumb and forefinger. Thumb nuts come with round or hex heads, typically with a shoulder. Knurling is common on round heads for added gripping. A sub-category of weld products, Apex Fasteners provides a wide range of weld nuts both in carbon steel and stainless steel. We have projection weld nuts and nut plates available both round and square to suit your application needs. We can also offer design advice for the weld nuts including hole sizes and material thickness requirements. Wing nuts have one or more vertical surfaces to grasp with the thumb and forefinger and manually tighten or loosen. The shape of the wings varies greatly in terms of height and width. Oval wing nuts have a single oval shaped wing whereas a typical wing nut has two separate wings. Wing nuts normally have a rounded base. Wing nuts are typically stamped or forged. A "catch all" category of all kinds of specialty nuts including castellated nuts like the one shown to the left. Examples of "other nuts" include specialty nuts, custom nuts, and mil-spec nuts.